Want to share a single keyboard and mouse between multiple Macs? How about using a keyboard and mouse attached to your Mac to control an additional PC running Windows or Linux, and even being able to share copy and paste data between the different operating systems? You can do that with the help of a great free tool called Synergy, and setting it up is easier than you might think. 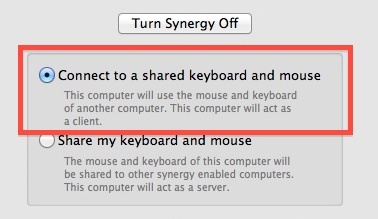 Confirm that SynergyKM and Synergy is installed on each computer you wish to share a keyboard and mouse between. Nearly every major operating system is supported, including Mac OS X Snow Leopard, OS X Lion, OS X Mountain Lion, Windows XP through Windows 7, Ubuntu Linux, Fedora Linux, amongst others, but this walkthrough will cover the setup with SynergyKM from a Mac standpoint. The only difference when connecting a Windows or Linux machine is the respective interface used to setup the connection. For the purpose of this walkthrough, we’ll define the primary Mac with the attached keyboard and mouse as the “host server” and any connected Macs sharing that keyboard and mouse as a “client”. This is a multiple step setup process, starting with the host server and moving to each client from there. The host server status should now be waiting for client connections. The “Status” shown at the bottom of SynergyKM host and client machines should now say “Connected”. That’s it! You are now free to drag the mouse cursor between each computer. Keyboard control follows the cursor as does the clipboard. 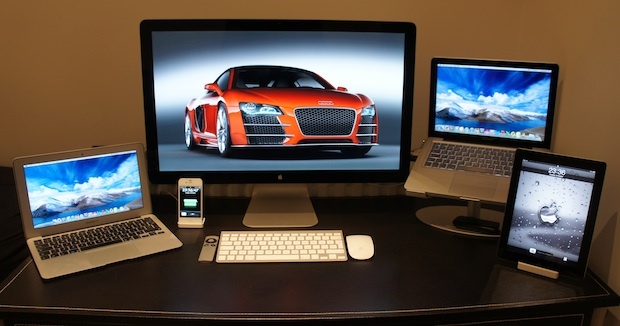 Screen savers will typically sync, as does waking each Mac from a screen saver, though a password must be entered on each individual Mac if a lock screen is used. It’s very important to name each entry to match the machines network Sharing name. Find the names by clicking on the “Sharing” panel in System Preferences on each Mac, it will be next to “Computer Name”. If you encounter problems with setup or connections, it is almost certainly related to the naming of either the host server or the clients. If you have an iPad but no extra Mac or PC laying around, you can use the third party app Air Display in a similar manner, though it basically just extends the desktop. Topmost Mac picture borrowed from a past Mac setups post. Update: Some users are experiencing issues setting up SynergyKM as a server in OS X Lion. If you are running into problems setting it up you may want to try limiting the Lion machine to a client function rather than a server, and running server either on a PC or another version of Mac OS X. Alternatively, you can also use Teleport but Teleport is limited to sharing keyboards between Macs only. This does not work in Lion. You need at least one Snow Leopard machine to get this to work. They have a bug in their GUI that has not been fixed. It does work in OS X Lion, I am using it right now. The client runs in OS X Lion but the server doesn’t for me. I solved it by using Windows as the server and Lion as the client. Never mind I have server running in Lion now, works perfect! :) it gives a connection error but then accepts connections. Must be a bug though it runs. Yes you can get it working by killing the process and then hitting start again like I said its a GUI bug but who has time for that bull. And you have to do this every time you reboot. But like I said as long as you have 1 snow leopard machine it works fine. ShareMouse has better Mac support, works in either direction without “server” and “client” and is up and running in a minute. Cool extra feature: You can also drag around files from one computer to another. seemed to fall over at the first hurdle. Couldn’t ‘turn on’ Synergy. Found information that says the ‘beta’ version doesn’t run on Lion?? Spent about 15mins looking for a non-beta version before giving up…. nice idea though…. I found a version 1.4.8 but it’s just called Synergy and it now works… the interface looks nothing like the one you have screen shots of though…. Doesn’t work on Lion. Couldn’t turn the Synergy on. Shows “Status: Error: No configuration available”. OK, now it not only doesn’t work on Mac Lion, but I am having difficulty to uninstall it. Please, test the stuff before you post on your web site. osxdaily.com so irresponsible. It does work in Lion, I’m using it right now. How about you try it before complaining? Wow, I am disappointed. I am usually very much a fan of OSXDaily, this is just downright bad reporting. This is an open source project from years ago, with ZERO support for the current Mac OS (Lion) let alone for the upcoming OS. It is also unsupported and does not work. While I think the idea is great, and if it were a real supported product I would be all over it, and the way this was written that was my expectations. But this is not ready for prime time, and best left to the hackers and people willing to be disappointed. Please, a little more research next time. @Scott, you can do the exact same thing with a utility called, teleport. => http://abyssoft.com/software/teleport/. I’ve been using it for quite a while now (in Lion 10.7.3) and it works. Yes, Teleport is an alternative but only works with OS X. Synergy allows you to share between Mac OS X, Windows, and Linux. 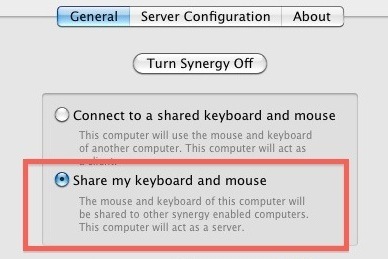 I use SynergyKM in OS X Lion 10.7.3 every day and am using it right now. I wouldn’t have written the post otherwise, try it yourself before proclaiming disappointment. @Will, I presume you at referring to someone else’s comment? I am not disappointed. (unless you are replying to Scott’s comment above. @Will Good point. Multi-platform. Thanks I use only OS-X so Teleport functions well. I do use Windows as a VM, so in that respect, Teleport is still useful. I’ll still check out Symergy though as I am always open-minded to better ways of doing things if they exist. Everyone saying it doesn’t work in Lion. IT DOES, it works as a CLIENT in Mac OS X Lion. Not a server. All that means is use a PC or an old Mac as the client, and connect to it with the Lion Mac. It works as both client and server, though apparently a lot of users are running into problems setting it up. It works though, I promise! Will please post you’re instructions for getting this process to work. It seems out of all the people you are the only one that has this working with no bugs. Works in 10.7.3 but you have to specify IP addresses not aliases. There are so many complains but not tips or anything to fix. Under the “Universal Access” section under “System Preferences”. On a side note if you are using a Magic Mouse, you might lose the scroll capabilities on it. Forgot to mention I am using OS X Lion as a server and using Windows 7 64bit as client. Works fine using 2 Lion machines. Setup the client hostname to “Name.local”, reboot both machines after you’re done with the setup. Few things in the preferences don’t work. After installing the drivers to my razer mouse the scroll works. Pity, everyone’s saying it works, but it doesn’t work on Lion. At least doesn’t work on my Macbookpro. Can anyone post an instruction here? I am trying to use Macbookpro as server and windows 7 as client. Thanks in advance! Try IP addresses for the connections, and don’t use spaces in the machine names. If all else fails, try using Windows 7 as server and the MacBook Pro as the client. I got it working on first try. I am specifying each network name both identifier and connection. No problems at all here. Got mine working as well. Was getting the “Timed Out” error but it had to do with windows firewall. Forgot to say that I could not get SynergyKM to work. I ended up using straight Synergy 1.4.8 on both machines. For all those who are saying “Doesn’t work on Lion” please think about what you’re saying. Synergy *does* work on Lion, and Mountain Lion too (as many users have said). It might be that you aren’t using the software correctly, I know it should work out the box, but there can be complications (firewalls, networking issues, having assistive devices disabled, etc) so please get help from our website before saying it doesn’t work specifically on Lion. And you should try using the stock GUI provided with Synergy, we worked very hard on it. SynergyKM and QuickSynergy are great pices of software and have helped a great number of people, but were designed to provide the missing GUI for 1.3 (which is now an ancient version). The GUI that comes with 1.4 is the same on all platforms (Mac, Windows, and Linux) and is designed specifically to work with 1.4, so by using this you will get the best user experience. Thanks, Nick! Fortunately, I read through all the comments and got to yours before I tried following the instructions in the original post. Doing as you said, I used the base Synergy installs on both my Mac and my PC, and did not use SynergyKM. It worked perfectly following the User Guide on your website.